Virtual switchboard to manage your phone calls, 100% customizable, without geographical restriction between extensions, with features such as welcome messages, call transfer, music on hold, voicemail, etc. The virtual switchboard is similar to the physical IP PBX, but with the difference that is hosted on the web, so no need to buy, installs or maintains a physical unit. Enjoy all the benefits of IP telephony with our virtual switchboard solution and discover our great calling rates. This virtual switchboard solution allows you to have your phone system in a few minutes without any hardware installation, because the solution is fully hosted on the Web. It facilitates the integration of all your branches on a single telephone network regardless of their location. In addition, you can enjoy features such as welcome messages, call transfer, music on hold, voicemail, etc. With IP phones, smartphones, tablets, IP phones, Softphones installed in computers and connected to the Internet, your employees will be connected to each other, with access to all the features of the virtual switchboard as if they were connected to a physical switchboard. - Add the desired phone number to the cart. - Select the desired extensions and add to cart. - Pay your order and receive your account information between 2 and 24 hours. We will email you the requested phone number as well as a sip accounts (format 87xxxxxxx). Each sip account will represent an extension of your virtual switchboard and must be configured in an sip terminal. 1- Define the devices where you want to receive and make calls. 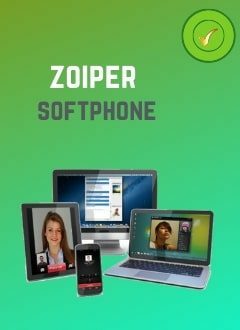 Extensions can be configured on sip phones, sip adapters (ATA) or computers and mobile phones where you install the softphone Zoiper, Wave or Media5fone. All sip terminals listed must be connected to the internet. 2- Configure each sip account on a device. 3- Define the numbers for each extension (for example, 101, 102, 103, etc.) and make the settings of your choice (welcome messages, menus, call forwarding, voice mail, music on hold, etc.). You can also ask our team to help you with these settings. Without boundaries between the extensions. Recording outgoing and incoming calls (option). Supports up to 100 geographic numbers. Blocking of outgoing calls by extension. The customer subscribes to the virtual switchboard service for his company and understands that he must configure it according to his needs. Hivoox is committed to providing tutorials and guides for the configuration of the virtual switchboard. However, the customer can request the help of Hivoox in the configuration of its switchboard. In order to receive calls from an external network in the virtual switchboard, the customer must subscribe to the virtual numbers service on the Hivoox website (+86 country numbers available on our website are compatible with this virtual switchboard). The fax reception function depends on the subscribed telephone number. The customer should check the list of fax numbers to see if the number chosen supports the fax function. The service has a validity of 30 days and is automatically renewed every month. If you subscribe on day 01, your next billing would be on the 1st of the following month. To cancel the service, send us an email requesting the cancellation of the service. Please note that your cancellation request must be made before the billing date and you should not have unpaid invoices. Since it is a virtual service and for obvious reasons, no refund is possible. Under no circumstances will the money paid for this service be refunded.